Once upon a time, a long, long, long time ago, there was a bang which wasn’t really a bang but more of a singular moment in time when all the matter in the universe came into laser-sharp focus and all that energy in there shook around and bounced off of each other and contracted and contracted until there was no more room so it expanded and BANG! exploded into tiny particles forming protons, neutrons and electrons – forming The Universe. Thousands of years passed and this universe kept expanding and expanding eventually forming stars and galaxies – forming The Moon and The Sun. My Universe. Every morning you wake up and vow that today you will be a better mother. You will be more patient, more adventurous, worry less, play more, not yell, improve your Barbie voice, run faster and harder when playing the monster game, get down on your hands and knees and inspect the dead slug. You vow to try and stay out of their way when they have disagreements – let them figure it out on their own – because you read somewhere that’s what you’re supposed to do. You promise not to let the “baby” and “puppy” voices grate on your nerves like nails down a chalkboard. You swear to squeeze them harder, linger in their embrace longer, and commit to memory every inhale and exhale as you watch them fall asleep. You vow that today will finally be the day that you don your Perfumier apron, and distill the warmth of their bodies, their sweet scent, in fine Venetian glass bottles. Because you understand – you know – that these days are fleeting. Every night you go to bed and vow that tomorrow you will be a better daughter. You will be more patient, more agreeable, better natured – not so reactionary. You will slow down and walk beside her – at the speed that frail and ravaged knees now dictate. You’ll listen patiently, enthusiastically to the stories you have heard many times before. You won’t pretend to know it all – because you don’t. You’ll remind yourself to let her mother you – because that’s what mothers like to do. You’ll remind yourself that these days are fleeting – you are fully aware of the preciousness of time. Time is insolent, it knows no do-overs, it is a dictator that can never be overthrown. No revolution, no hunger strike can change its course. It is expanding – continually expanding. And so you long to curl up in her lap again – just like you did when you were a child. To have her smooth, always elegant hands run through your hair – just so – to have her gently sing you your favorite lullaby. You’ll remind yourself that once upon a time you were her Universe – you still are her Universe. You stain your hands blood red from the fresh strawberries. 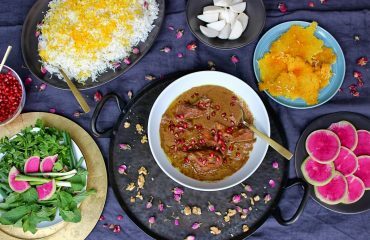 Many times you’ve had strawberries macerated in balsamic, but since you usually don’t have any balsamic around and you’re not willing to make a trip to the store, you reach for the bottle of pomegranate molasses you always have on hand. You watch the syrup languidly ooze out of the bottle and bathe the strawberries. 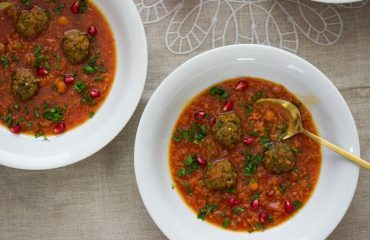 You set the bowl aside and allow the flavors to meld and dance in perfect harmony. You ask your girls – your taste testers – your shadows – your Moon and Sun – what else the macerated strawberries need. 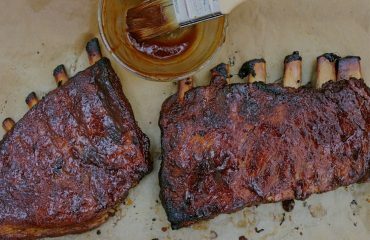 They savor their bite, licking their lips with big smacking sounds, and confidently declare it needs salt. It doesn’t need salt. They always say it needs salt because that’s what you always say. Your words, your opinions, still carry weight. You are still their Universe. You remind yourself it won’t be this way forever. Time is fickle, time is irreverent. You watch the cream slowly churn as you add the rose water and for a moment you are transported to your grandfather’s garden in Tabriz. You were six years old chasing butterflies through the rose bushes. You put the cap back on the bottle and just like that the memory fades. Memories trapped in bottles. You turn to tend to the dinner simmering away on the stove. You reach for the salt bowl. You feel your mother’s observant gaze follow your every move. Gently, she reminds you not to add too much salt. You snap back saying you haven’t. Instantly you regret it. You taste the stew, it’s too salty. She was right – she is always right. Slowly, cautiously she makes her way over, puts a gentle hand on your shoulder and tells you not to worry. She’ll fix it with a little more lemon juice. She’ll fix it. Because that’s what mothers do. 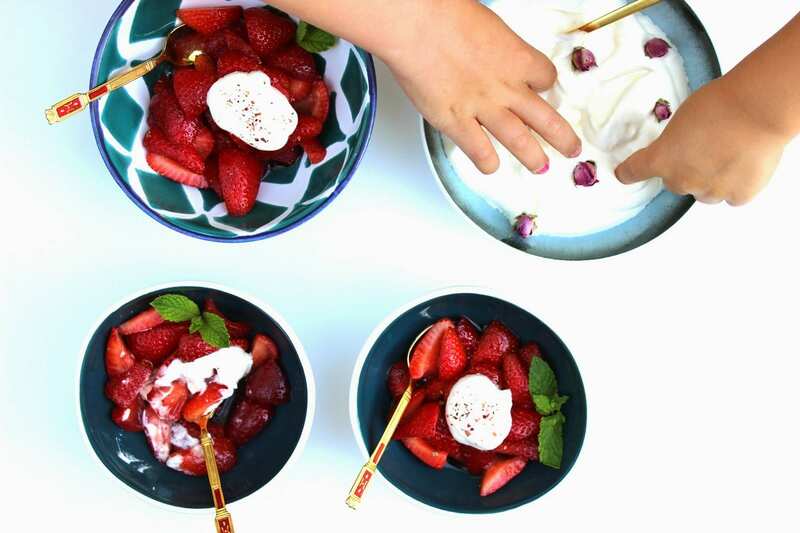 You serve the strawberries – tangy, sweet juices and all – and add a dollop of the rose cream to each bowl. You instinctively extend your arm out to your mother. She balances herself and gives her weight over to you. Your other hand reaches for the Moon as the Sun clings to your apron. The four of you make the slow, short walk from stove to kitchen table. Mothers and daughters. Protons, neutrons, electrons bouncing off of each other. 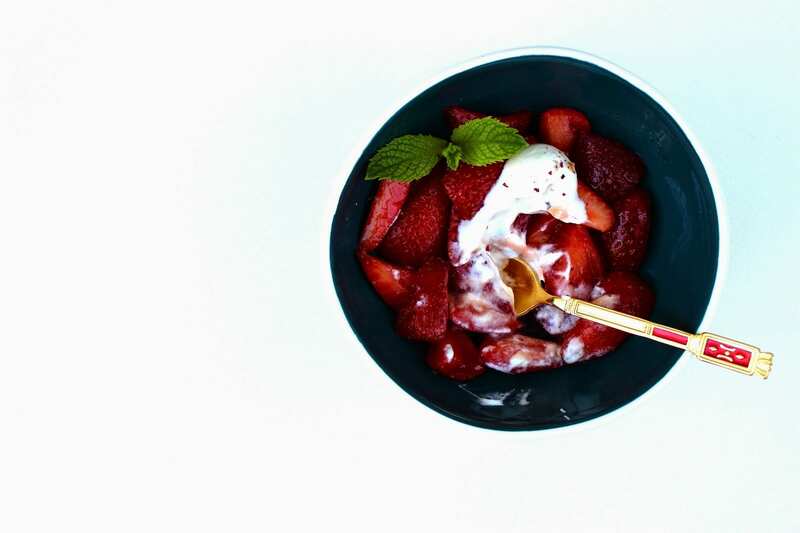 As you dig into your bowl of pomegranate molasses strawberries you look around you and marvel at it all. The Universe – with all its mysteries and certainties is a beautiful thing to be a part of. Your heart contracts and contracts and just when you think there is no more room BANG! it explodes and expands. Mothers – daughters. It’s beautiful – it’s complicated – it’s love. *I don’t like my cream very sweet so I don’t add too much of a sweetener to it. Feel free to adjust to satiate your personal sweet tooth. You can also substitute the maple syrup for any sweetener of your choice. 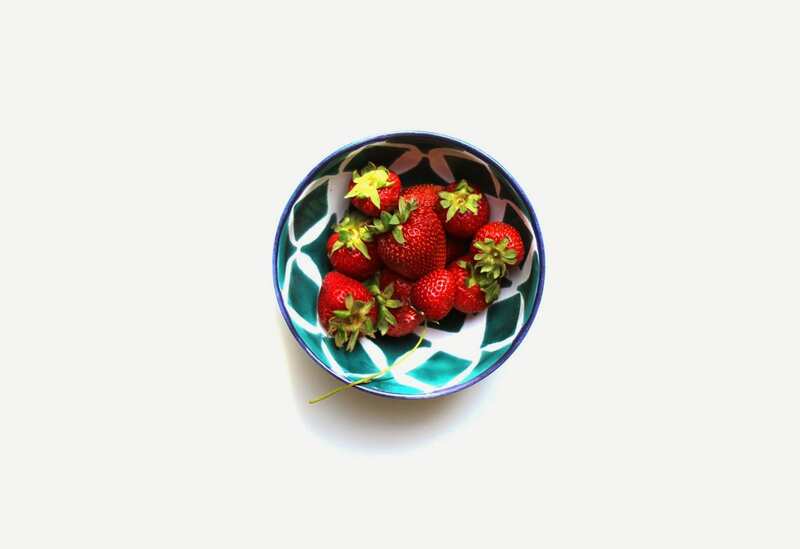 1- Place strawberries in a medium sized bowl. Add maple syrup and pomegrante molasses. 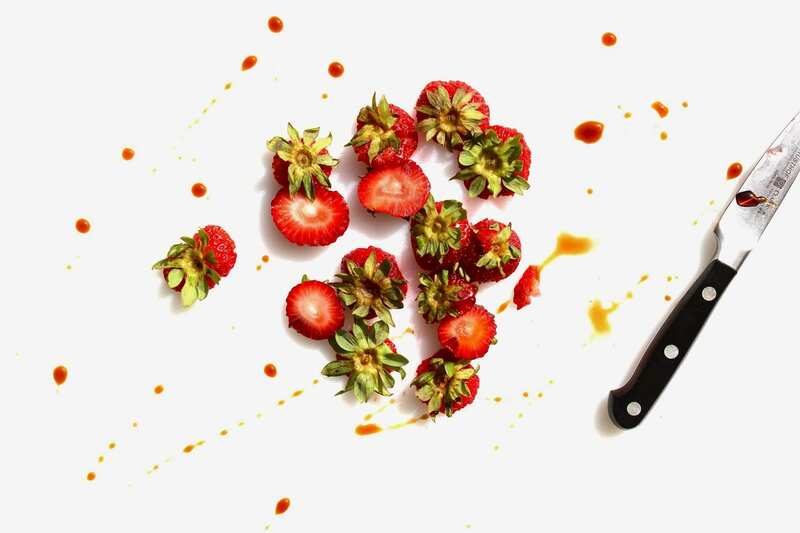 Stir to combine and set aside allowing all the flavors to meld, until the strawberries release their juices. About one hour. 2- Chill the bowl and whisk of your stand mixer in the fridge or the freezer. Once chilled add the cream, sugar and rose water to the bowl and whisk starting on a slow speed and increasing to a high speed until soft peaks form. Adjust flavors as needed. 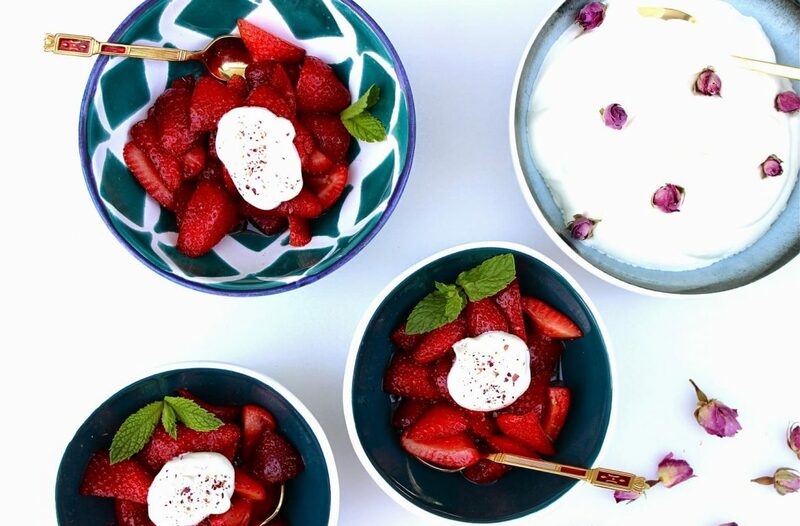 3- Serve the strawberries and their juices in a bowl with a dollop of rose water cream. Garnish with a dusting of ground up dried rose petals and a couple of mint leaves. Enjoy right away. The strawberries are also fantastic over Greek yogurt or on your morning pancakes and waffles! Thank you for your lovely comment Mehrunnisa! Ioana, thank you so much! Your words mean a great deal to me. Dear Mahroo, thank you so much for your sweet words.